There’s no messing about with that title. Unfortunately, the introduction itself is less direct – there is a short introduction to the introduction – and I actually fell asleep during my first attempt. Here goes round two. The first sentence is unobjectionable (even if that isn’t the way I would have phrased it), the second sentence I merely disagree with, the third sentence I simply don’t understand. That is to say, if it means anything that I can understand it to say then there is no point saying it. Putting aside the fact that it is strange that Hartwell feels he needs those quote marks, you will note that the anthology will only focus primarily, not exclusively, on hard SF. 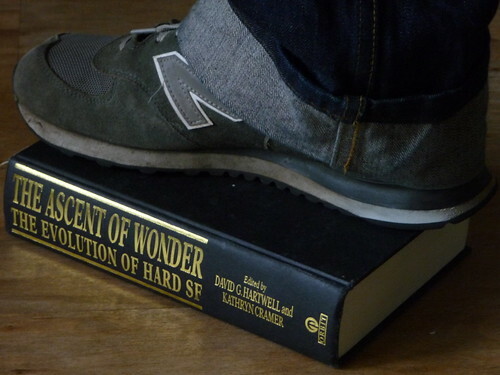 This is, let us not forget, a book subtitled “The Evolution Of Hard SF”; what other purpose can it serve? Who is “we”? As a point of housekeeping, Cramer has already had her introduction and – although I would have preferred a joint introduction from the editors (and Benford’s sole contribution to be fictional) – Hartwell is writing as an individual here. As a wider point, Hartwell’s facts aren’t my facts. And just look at that absolutely barking first sentence: people who don’t read SF are prejudiced against science! Not only is it absurd but he seems to have instantly forgotten he was discussing anthologies aimed at SF readers. Christ, I’m only on the first page of the introduction, I’m not sure how much more of this I can take. There are eight more pages of this but I’ve made myself depressed and I’ve given myself a crick in the neck from typing those quotes so I am going to stop now before I do myself any further physical or mental damage.